Many area residents took part in the annual “Polar Plunge” by jumping into the 31-degree Cedar River at Cedar Rapids last Saturday, Feb. 23. 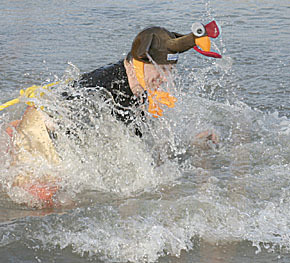 First in the water was Cedar Rapids High School Principal Matt Asche, complete with a “turkey” costume. We’ve heard of “turkey in the straw” but not “Turkey in the thaw”…….and Principal Asche is anything but a turkey!